Some games just are like that. Although they look simple, they can be pleasantly addictive! Just like Colour Cannons, in which you shoot at balls of the same colour as your cannon. All you must do is completely burst the cluster of balls at the top before the 1000-ton roof falls down. The game can be very addictive! Don’t tell us we didn’t warn you! 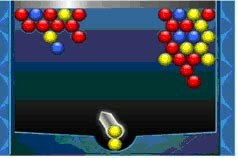 Left-click to shoot a cannon ball at a cluster of two or more cannons of the same colour. Pile up your scores for clearing the board as fast as possible.